Our days were packed with driving here and there, dropping off rice here, visiting this person there, etc., etc. One evening we went to the beach to relax and recoup before the next days work. We drove past several quaint little beach bars/restaurants along the way. All nestled along the coastline, each with their own individual charm, full of atmosphere and African culture. We happened upon Ramada's. We ordered our meals as we took in the absolutely beautiful scenery around us. The food is prepared when ordered, fresh and never recooked. You might have to wait a while to get your order, but it is well worth it and the atmosphere during the wait is incredible. I've been told that the Tourism Ministry plans to demolish all these wonderful little beach restaurants to make way for the high rise hotels and fancy restaurants. I hope this is not the case, as I would seek out a place like Ramada's any day over the fancy buildings. I can find high rises along the coasts in America, I can't find the little beach hut bars/restaurants such as Ramadas. Our evening was so enjoyable that we returned two more times during our stay in Freetown. The photos above are of Fr. Seraphim and Roo taking in the beauty of the beach, the second one is us listening to the "ocean" in a shell, I gave the owner, Ramatu my shirt and put Fr. Seraphim's shirt on since my shirt had a photo of Ramada on it and I felt the owner should have it. It was wonderful to be back in Sierra Leone, reunited with old friends and family. We miss them all so very much and look forward to our next return. All graphics & photographs in this blog are the copyrighted property of (unless otherwise indicated) Nazareth House Media, a division of Nazareth House Apostolate and cannot be copied, printed or used without written permission from NHA Media, Louisville, KY. The rainy season continues in Freetown. At times the rain is so hard you cannot see in front of you. Yet, the people must continue with their daily business despite the water. The next few posts will contain several photos that I hope will help you get a real feel for the streets and sights of Freetown. James reports to me that Six more boxes have arrived in Freetown. There are several items in this batch that we were counting on for our mission. We are thankful that they have arrived and we'll be there when we arrive. James has just returned from Kabala where he found the workers hanging the blackboards and the finishing touches of the school being well under way. It looks like the Grand Opening will be on schedule. Thank you, again for making possible the opportunity of education for these beautiful children. The students send their love and greetings to you all! 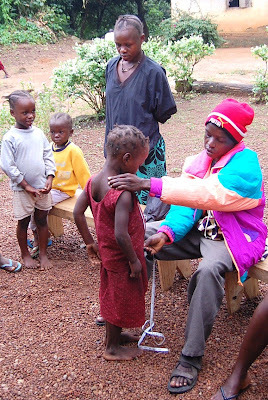 Children in the Kabala Village are being measured for their school uniforms. Tailors and Seamstresses are running their sewing machines all day long!!! How exciting that Nazareth House Apostolate, through your loving generosity, will open the school this month! BRAVO! NHA purchased the land for the school in January 2007. The ground was cleared, surveyed and prepared that Spring. The land contained large rock. The clearing, digging and smashing of these rocks was very hard work! The actual construction of the school building began in June 2007 with the digging of the foundation. The construction workers must work under terrible conditions (Heavy rain, illness, etc) with very primitive tools. There was no ditch diggers, it was all done by hand. They are remarkable craftsmen and their skill and quality of work is second to none! We applaud these men and thank them. We also thank their families for the sacrifice they made allowing these husbands & fathers a leave of absence from their home to work long hours at the sight. Pa Foday came to Fr. Seraphim and I in the year 2002 with a dream of a school for this village. He had meticulously outlined on paper, the needs in which to build it--down to the amount of nails, hammers, etc. At the time, raising the money to do such a project seemed overwhelming to us. 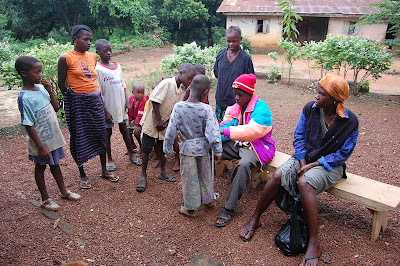 During the Fall of 2006, when we actually were able to make our way to Kabala, I met with the teachers. 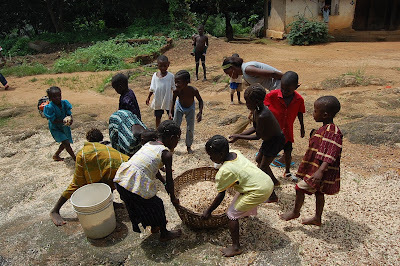 At that time, the children were meeting everyday for school in the open air. After that meeting, we were convinced that this was something that could happen. It has happened. Pa Foday will realize a fufilled dream within weeks. As is usual, we Americans tend to make things "bigger" and this school is much bigger than planned. However, the more we can provide an education, the more chance at a better future for a child. Thanks to all! Congratulations, you have done a great work! In perfect timing, once again, compassionate individuals from all over the United States and even some from Europe have come together to make possible the work of Nazareth. It is truly an act of love...love for our brothers and sisters, the love for each other! Your gifts are like seeds. Now we have only to physically deposit and implement these beautiful seeds of love and watch them grow. Every donation of every size is a blessing to the giver and to the recipient in many ways. Every gift is meaningful and special. Nazareth House received an email from One Love Foundation (www.1lovefoundation.org). It explained that they are a newly formed Charitable Organization from Summit Hill, Pennsylvania. Presently they are working to fill a 40 ft container to send to Freetown for Fr. James Sandy, pastor of St. Martin's Parish for his community and the children of St. Mary's Orphanage. They have not raised the full amount of money to send the container ($8,000), and still need to do fund raising. YET, they were concerned about our mission, having read our blog and admired the work of Kadijah and James through Nazareth House. 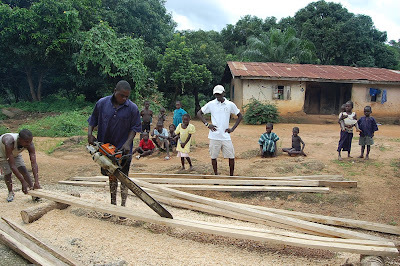 They could not allow us to go to Sierra Leone without making our goal. Putting the NHA mission as priority, they sent in via paypal the difference to make up our goal for uniforms and on-the-ground needs. One Love Foundation asked that we fulfill a gift from Mrs. Amy Burkey's 7th grade Social Studies Class at Penn Kidder Elementary School. 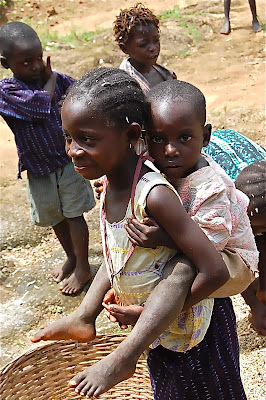 These children, upon hearing about the situation in Sierra Leone, raised $200 for mosquito bed netting. 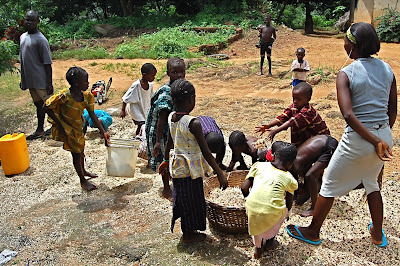 They asked that we use the $200 to provide mosquito bed nets for some of the children at NHA Kabala School in honor of our contractor's child who died while he was away from his village working on our school. I am happy to report that with this donation, along with all the previous contributions to this specific mission and the funds that came in today - we have made ALL of our goals and will also be able to add to the 7th graders' gift from Penn Kidder School to provide a bed net for the children at our school and some families in Freetown, also. James is checking on the price of bed netting in Freetown today, but it is possible that we will be able to provide 100 bed nets for 100 children! In other West African countries a bed net can be bought for $5. In the past, we've paid $10 in Freetown. By purchasing in bulk, James is hoping to negotiate a better price. Never-the-less, we are pleasantly surprised to be able to add the gift of bed nets to many children. What a blessing to be able to provide both bed netting to fight off the wicked mosquitoes and the internal parasite medications. Truly, truly the out pouring of love is overwhelming. Thank you ALL. This has been an act of unity to the tenth power!!!! !